After an afternoon review, troubleshooters were asked to double-check the torque on six bolts around a presumably leaky flange fitting and tighten if necessary. If subsequent leak tests show no more signs of seepage, a NASA spokeswoman said, Discovery could be cleared for launch as is. Otherwise, engineers likely will be forced to evacuate launch pad 39A and drain the on-board propellants Wednesday before work to change out a suspect seal. NASA officials say enough contingency time remains in the processing schedule to complete the work in time for launch Nov. 1 as planned if no major problems are encountered. The trouble involves seepage of toxic monomethyl hydrazine, or MMH, fuel at a crossfeed flange in the propellant plumbing of the shuttle's right-side orbital maneuvering system rocket pod. The shuttle is equipped with two such rocket pods, one on either side of the ship's vertical tail fin, that burn monomethyl hydrazine with an oxidizer, nitrogen tetroxide, to carry out maneuvers in orbit. After testing over the weekend, engineers were able to trace the leak to a specific area of a large flange where two sections of propellant line come together. But it is not yet clear whether the seepage involves a loose bolt, a seal in the flange or the flange itself. The right-side OMS pod was removed after Discovery's most recent flight in April to repair a helium isolation valve in another part of the system. After the pod was re-installed in July, leak checks were normal and no obvious loss of pressure has been noted. But insulation around the flange was found to be damp with MMH over the weekend. 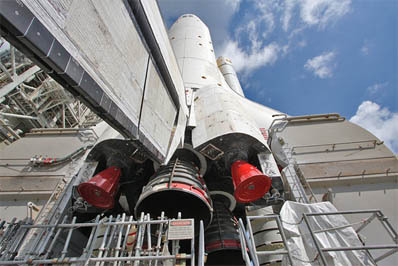 Because the propellants are extremely toxic, the OMS pod tanks must be emptied and the propellant lines drained before any invasive repair work. With Discovery in the vertical orientation at the launch pad, removing residual propellant from the lines is expected to be difficult. Even so, engineers believe they can replace the seal, if necessary, and reload the system in time to make the current launch date. Replacing the flange itself at the pad would be much more difficult, engineers say, requiring lines to be cut and welded. As of Monday, the launch processing schedule included four days of contingency time to handle unexpected problems. Discovery is scheduled for launch on a space station resupply mission at 4:40 p.m. EDT (20:40 GMT) on Nov. 1. If the shuttle is not off the pad by Nov. 5 or 6, the flight will be delayed at least to early December because of conflicts with other launches, already planned space station spacewalks and temperature restrictions due to the station's orbit. Senior NASA managers plan to attend an executive-level flight readiness review at the Kennedy Space Center next Monday to review ground processing and to set an official launch date. Updates will be posted here as warranted.